Wharton's Peter Conti-Brown discusses his new book on the Federal Reserve. In The Power and Independence of the Federal Reserve, Peter Conti-Brown, a professor of legal studies and business ethics at Wharton, attempts to demystify the Fed and its role in the U.S. economy. Conti-Brown recently appeared on the Knowledge@Wharton show on Wharton Business Radio on SiriusXM channel 111 to talk about the book. Knowledge@Wharton: The Federal Reserve (Fed) has been right there in the front of a lot of what you see in the news these days: anything revolving around the U.S. economy, and in some respects, the global economy as well…. Talk a little bit about [the concept behind the book]. Peter Conti-Brown: Any time you talk about the Federal Reserve, especially in the public — especially after the crisis, frankly — there’s this sense of mystery, a sense of conspiracy. If you look in the Library of Congress catalog of books on the Federal Reserve, there are shelves that have just grown under the weight of the conspiracy theories behind them. Some of these are pretty harmless — for example, the Council on Foreign Relations and the Federal Reserve run the global political system through Bohemian Grove, or something like that. [Some] are kind of silly. Some of them are actually quite evil. It won’t surprise you, a lot of anti-Semitism shows up in these books. Part of what was motivating me over the last six years that I’ve been working on this book was getting at what makes the Fed such a uniquely mysterious institution, that draws these conspiracists out. On one part it might be, “Oh, because what the Fed does is so technical.” Many of us stopped taking math in high school. Those of us who continued math through college still didn’t get the education needed in order to do monetary policy in the heavily mathematical way that it’s done. But that actually doesn’t make much sense as an explanation either. Because if you’ve ever read an application to the Food and Drug Administration for a new medication, you’ll see it is not written in English. This is only for experts. The same is true for the EPA [U.S. Environmental Protection Agency], or the FCC [Federal Communications Commission], or any other agency of government. This is technical work. So that doesn’t distinguish the Fed. That’s the same with all of them. 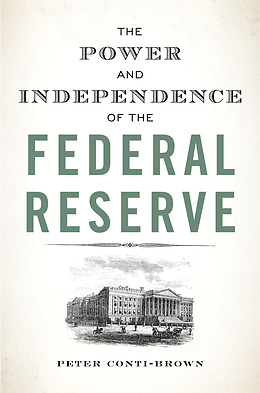 What does distinguish the Fed, and here’s part of the title of the book, is this extraordinary concept of independence. So we have the story about national government coming to us from the Constitutional Convention, and the pen of James Madison, that government is this tripartite structure. We’ve got legislative, executive and judicial. Well, where does banking come in? Formally, legally, the Federal Reserve is a creature of Congress. It’s created by statute. But its functions are quite different from functions of making law or enforcing law or judging between competing views of law. It is a financial, a banking function. The Fed is structured by time and practice and law, to be apart from these other three branches. It’s not a co-equal branch of government. As I said, it’s subject to Congressional and other kinds of political oversight. But there’s this idea that the Fed is independent. When I started working on this book about six years ago, it started as an article. I started puzzling through, “Well, what do we mean by this concept of independence?” In some sense, independence sounds great. That’s like motherhood or fatherhood or apple pie. Conti-Brown: It’s All-American. We are independent. But what does it mean when you say you’ve got an independent central bank? Well, scholars have been studying central banks for centuries. They have been studying this concept of central bank independence most actively for about the last 30 to 40 years. They have a working definition of independence, which I learned very early in my research. It goes something like this. Let’s refer to the Federal Reserve in particular. So, the Fed is independent because number one, there is a legal separation between the Fed Chair — Janet Yellen, Ben Bernanke, Alan Greenspan, and the like — and the President. The reason for that legal separation between those two people is because we want the Fed Chair, who runs the Fed, to make monetary policy with an eye toward price stability, low inflation. If we put that set of tools in the hands of the President, the President wants to either run for re-election or insure a good legacy. The fear is that the President will have the temptation to goose the economy artificially with high inflation so that short-term problems go away, even if they create long-term problems down the road. There are about five aspects of that definition I just described. Number one, the law is doing the work here. Number two, that the Fed is just a single person, the famous face that we see in the newspapers. Number three, that the outside audience that’s trying to influence monetary policy and the Fed policy is the President. Number four, that the Central Bank’s mission is very technical and technocratic. It’s only the work of expertise. There are no values, ideologies. In a word, no politics. Then the fifth one is that the Fed is only oriented toward keeping inflation low. In my book, I … pop each one of those as myths. The Fed is a “they,” not an “it” or a “she” or a “he.” Its internal governance matters enormously, in terms of who exercises power within the Fed. More than just the President are interested in how the Fed operates on the outside. This includes other politicians, like members of Congress. But it also includes international central bankers, academic economists, the public, the markets in the abstract and many others. Number three, law is not doing the work people think it’s doing. I trained as both a historian and as a lawyer. As I’m reading through these statutes and thinking about how they changed over time, I saw that the stories we tell about the legal structure of the Fed are largely sometimes incomplete, sometimes false. Number four, this idea that what constitutes central banking is just the purview of experts, and if you take the right classes and take the right exams and you write the right papers, everyone will agree. That’s incorrect. For the most interesting and most controversial of decisions that central banks have to make, there’s a point at which the technical apparatus is exhausted and doesn’t produce a unanimous decision. Then there’s a gap between that point where being an expert’s not going to help you anymore and the moment of decision-making. What fills in that gap? Well, this is a word central bankers don’t like to hear, but it’s true. Ideology. Values. Judgment. Now, that’s not peculiar to central bankers. We all have ideologies. We all have values. But the point is that the values of the individual central bankers are going to be what drives the filling of that gap between their technical expertise — which is incredibly relevant. It’s not like it’s just politics by another name. But that gets them past that expertise and to the point where they’ve got to make decisions under conditions of uncertainty, which of course they’re doing. Then the last thing, the idea that the Fed is only in charge of keeping inflation low, is false historically. It’s false today. It’s false tomorrow. The Fed does an extraordinary number of different things that have been stuffed inside the institution by an eager Congress. Eager to see the Fed use its power, authority, reputation, to accomplish all kinds of goals…. We need to look at the Fed where the Fed lives. Not just in this stylized version of the Fed that people talk about, which turns out not to be true. Knowledge@Wharton: We’re sitting here in the studio. We’ve got CNBC on in this studio. We’ve got Bloomberg on in the other. Everything around finance, and of course everything around the Federal Reserve, is publicized. Every time Janet Yellen goes to speak in front of Congress, it is an all-day TV event. From that perspective, bringing a book forward talking about the independence of the Federal Reserve, there’s no better time to do it…. Conti-Brown: One of my basic arguments that’s kind of the punchline here for all of this — if I had to boil it down to maybe two points, I would do these two. Number one, there’s this sense that when you’re talking about the Fed, you either have to be for it or against it. I get that all the time. When people find out I’ve written a book about the Fed, they ask, “So are you for it or against it?” My argument is that that is the wrong way to approach this extraordinary and extraordinarily powerful institution. Better to put that question to the side…. Let’s have a dispute later, once we understand what it is that we’re talking about. My argument, like Bagehot before me, is to say, let’s not be obsessed with single sentences about the Fed. Let’s take some time and devote some deep thinking about the structure, so that we’re not engaging in either conspiracy theories, on the one hand, saying that the Fed is responsible for everything that’s evil in the world, or on the other hand saying that the Fed can do no wrong, and that challenging its actions is challenging the very legitimacy of government, or something like that. Knowledge@Wharton: You talk about the jumble of functions that Congress has given the Fed over the course of a century, about how it’s kind of undermined the efficacy of the appointment process. Talk a little bit about that. Conti-Brown: Well, one of the big problems that we have with having a central bank that exists with any kind of insulation from the political process is a question of legitimacy. Because in a democracy, the way you get legitimacy to exercise the power of government is through elections. But of course at the Fed, the leaders, the people who sit in the big chairs, they’re not running for office. That’s actually a very, very good thing. We don’t want elections determining every single decision that the Fed makes. But here’s the problem. We need some sort of tie. Currently the tie into elections, democracy, to the central bank, is at the level of appointment. The President appoints seven of the members of the Federal Open Market Committee, and Senate confirms those seven appointments. But appointing them for what? That’s deeply problematic, because it’s oversimplified. That means we’re ignoring all the other many, many functions that the Fed has. We saw before the crisis that by ignoring these functions, by putting people in the big chairs, pulling the big levers without knowing anything about their regulatory philosophy, their ideas about consumer financial protection, their experience overseeing the payment system, which became an issue before and after 9/11, we are essentially abdicating on the public accountability of the appointment process. Because we’re not able to ask them what it is they know about the many tools that they’ll have in their toolkit. Because we’ve rendered the Fed as only an inflation-fighter. That might be a good idea in theory, but that is not what the Fed is in practice. Knowledge@Wharton: One of the areas off of that that we should probably talk about is the creation of the Consumer Financial Protection Bureau, at the behest of Elizabeth Warren. As you wrote in the book, in the history of law reviews it’s probably safe to say that there’s never been an article as influential in institution-building than that one. Conti-Brown: Elizabeth Warren wrote a magazine essay in 2007 that was playing with this idea that there are so many rules that you have to follow if you’re going to build and sell a toaster. But there was essentially nothing that you had to do in order to build and sell a mortgage. This is 2007, ahead of the crisis. So this is a short article for a magazine. Then she wrote a law review article with her co-author to really go through systematically and say, “Here’s what the laws are, here’s what the functions are.” So she advocated consolidating the existing authorities that had been scattered among five, arguably seven, different agencies, to put them in a single agency. This is what became the Consumer Financial Protection Bureau (CFPB). Now, the CFPB is hugely controversial, along essentially partisan lines. There are few, if any, Republicans who like it, and there are few, if any, Democrats who don’t. That’s regrettable in its own right. But here’s the thing that’s really great. I think all of us should agree, whether you’re a Republican or a Democrat, that by carving out from the Fed — the Fed was the primary regulator for consumer financial protection — those functions into a separate agency, now whether you hate the CFPB or you love it, every single time a President appoints a new director, we have a conversation devoted exclusively not to that person’s views on monetary policy — not whether she’s a dove or a hawk — but what is that person’s views about the existing consumer financial protection laws, and his or her theory of how those should be enforced. This is more than just theory here. This is in practice. So to give you a good example, a famous and very well-regarded and widely respected economist named Laurence Meyer was an appointee by the Clinton Administration in 1990s, to the Fed’s Board of Governors. This is seen, appropriately, as a sterling appointment, because he’s the real deal. But he’s a real deal as an economic forecaster and macroeconomist. When Joseph Stiglitz, who’s the chair of the Council of Economic Advisors, gives him a call and says, “President Clinton’s thinking about appointing you to the Fed,” they had a brief conversation about monetary policy. Then Stiglitz says, “And by the way. We’re not going to seek to influence you at all, but we are big fans of the CRA.” Meyer starts to stammer, “Oh, the CRA. OK.” Then they hang up. All of a sudden, Meyer’s fax machine starts spitting out a 60-page history of the Community Reinvestment Act, which he’d never heard of. He didn’t know what CRA stood for, right? Now, here’s what’s remarkable about this. He said that he learned quickly. Then he became the federal government’s number one point person on enforcing the CRA. I mention this story not to discredit Meyer at all, in any respect. The idea that one person is going to have expertise in all of the different functions of the Fed is fantastical. But the fact that he became the number-one enforcer of these laws is itself something of an absurdity…. Let’s be clear: The CRA is one of the most important pieces of legislation in consumer financial protection, that people love or hate but is unquestionably important. To not know what it is as the primary enforcer of that act, will never happen again, whether a Republican or a Democrat appoints the director of the CFPB. That person will have an opinion about the CRA, and the many other legal authorities that the CFPB has. Now, I’m importing from this debate, because this is very much about Fed governance. Because again, this is what the Fed had done before the Dodd-Frank Act. Because this is the place where politics is at its best with respect to the Federal Reserve. And that is at the Fed’s governance. The appointment process. To be able to have serious conversations. Not to micromanage central banking functions, but to make sure that the process that we have through centuries of experience, realized is very bad but is better than all the other alternatives, is democracy. And that process is good at identifying whose values will get voiced. Knowledge@Wharton: You talk also about how the mission of the Fed is changing: the things that they’re looking out for, the systemic risks, bank supervision. What are some of the other new demands that are really important to the Fed, and how they manage them? Conti-Brown: I call this chapter on … the Fed’s non-monetary policy functions, “The Once and Future Federal Reserve.” This is, of course, a reference to the idea that King Arthur is the once and future King of England…. “Once and future” meaning that many of these functions were the Fed’s functions at its inception. Now, after a multi-decade period where the Fed became almost exclusively interested in using a single instrument, short-term governmental interest rates, to do a single thing, which is effectively balance between unemployment and inflation — we start to see the Fed returning to its roots. So, what are these roots? Well, part of it is overseeing the payment system and making sure that payments are able to clear, and that people are eager and willing to engage in the clearing of each other’s transactions. These people here mostly are banks. But importantly, as we learned from the financial crisis, not exclusively banks [but] financial institutions of all shapes and sizes. So the Fed has come back in a very big way, receiving a huge boost from Congress in the form of the Dodd-Frank Act, to returning to two different kinds of regulatory and supervisory authority. One, what we might call ex-ante authority. Meaning, before a crisis occurs, here’s what the Fed’s going to be doing and requiring financial institutions to do. Everything from making sure the loan-to-value ratios for mortgages are being met according to regulations, to making sure that banks are structuring their balance sheets such that they are more weighted toward equity, as opposed to that variety of other different kinds of functions. On the other hand, ex-post supervision and regulation. In the post here, the after-the-fact is the fact of a financial crisis. Again, this has very little to do with monetary policy. There are connections, for sure. But this is a separate conversation. Managing both the looking into the future and seeing where risks are becoming deposited in the financial system, and then looking back into the past and saying, “Now we’ve had this financial crisis. How do we clean it up?” The Federal is spending lot more time thinking about these kinds of questions across the board. They had thought about these questions much, much less for the decades between roughly — we could say about 1955 or so to 2008. Research by Wharton's Peter Conti-Brown examines the intersection of law, finance, history and politics to paint a more accurate picture of one of America's most venerable institutions. The U.S. Federal Reserve is touted as the most powerful single institution in the country. But many people don’t have the foggiest clue about the ‘epic struggle’ involved with launching the central bank in the early 1900s. The Federal Reserve is a private banking cartel. It is not part of the government. The Fed is America’s third central bank in her 240 year history. If central banks are so good, what happened to the first 2? Jamie Dimon, the CEO of JP Morgan – a bank that received at least $26 billion from the Fed – was on the board of directors of the NY branch of the Fed until February of 2013. The Fed then gave $16 trillion, free and clear, to Wall Street, the very people who caused the crisis of 2008. Too long of an article for my taste. Allowing the Fed to set monetary policy by setting the discount rate, reserve requirements and via open market operations is one thing. My problem with the Fed is that the Treasury relinquished its power to print money to an organization owned and controlled by private banking interests. The US Treasury used to issue treasury notes which was essentially equity funding, since the currency is only backed by the power of taxation. Now the US only funds itself with debt. Federal Reserve Notes are backed by nothing more than the power of taxation, but the public has to pay interest on money created out of thin air. The other problem is while the President may select the Fed Chairman and a majority of the members on the board, the government can’t pick anyone they like, they’re only allow to select from a list of candidates approved by the NY banks. The Fed may claim to be acting in the public interest, because the banks like to think they know what’s best for the economy, but in reality the Fed works on behalf of its shareholders. Look at the debt created under quantitative easing where the banks were handed money at 0% interest with no strings attached of what they did with it. They didn’t lend to business and consumers, they bought T-bills and speculated in foreign markets. The QE was nothing more than a giant subsidy to the financial services sector which neither the public nor the Federal Government can do anything about. Congress could amend the Federal Reserve act and return the power to create money to the Treasury, but they’ve been bought off. One doesn’t need foreign ownership or conspiracy theories to see the flaws in the system. Given the level of corruption and organize criminal behavior seen in the financial sector over the past decade, how can we continue to allow that sector to govern itself and dictate to the public what’s good for them? Mathematical models notwithstanding, central bankers worldwide are running out of tricks to fix the world economy. The financial sector sold governments some BS theories starting around 1980, which have failed to deliver the results promised, but we continue to allow the same assholes to run the financial system. May I presume to ask: What is the Fed? — a country can not exist without a Central Bank. The answer to “why” that is the case answers the role and purpose of a Central Bank. To exist without it is an impossibility. Therefore one lives perforce with it. It can be thought of as a virtual unseen senior member of the Board of any chartered Bank, Federal or State, with special powers to direct the activities and operating policies and management of the Bank, if occasions so require, in the Central Bank’s sole discretion. The question of “independence” is not between the Central Bank and the government. It is obvious they are interdependent. The concept of “independence” is more properly this: The Central Band is independent of Banks but Banks are not independent of the Central Bank.